The Silverton Caldera is highly mineralized, and acid rock drainage and poor water quality were prevalent long before the advent of mining. The area has been the focus of significant research on its geology and mineralization to better understand how metals loading has adversely affected the Animas River and aquatic life. The reports below provide substantial research on a variety of topics pertaining to the Silverton Caldera, SGC’s reclamation activities, and water quality in the Animas River. 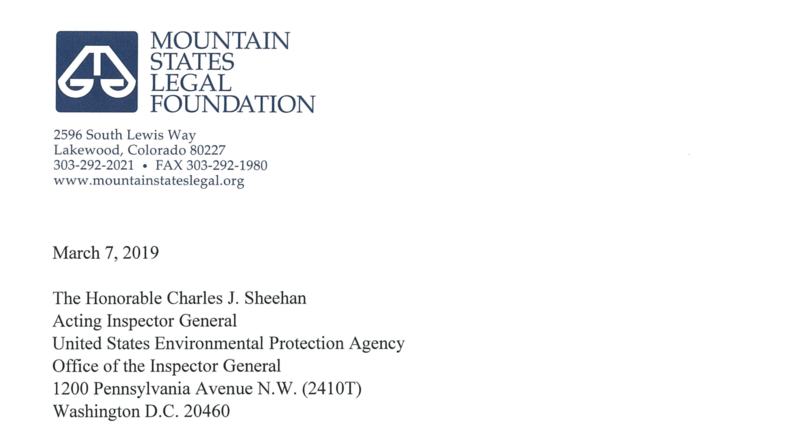 A letter from the Mountain States Legal Foundation (MSLF), a non-profit public interest legal foundation, to the EPA Inspector General regarding EPA’s conflict of interest as Lead Agency for the Bonita Peak Mining District. Read more on the MSLF website. 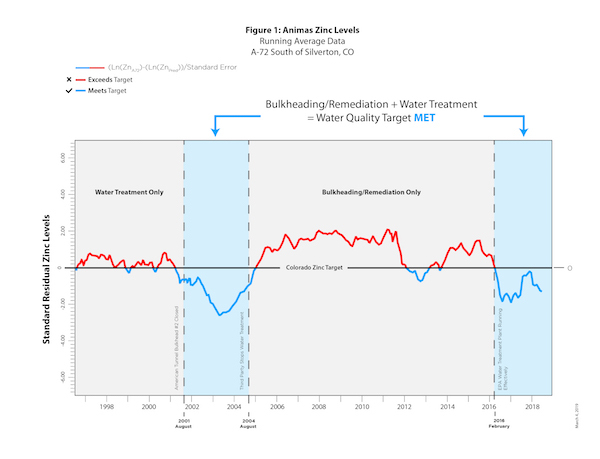 A summary of water quality data compared to the Colorado Department of Public Health and Environment’s zinc target, which illustrates the success of SGC’s bulkheading and remediation (updated March 4, 2019). This incorporates new data from River Watch released in February 2019. An analysis of Animas River water samples from A-72, applying the Colorado Department of Public Health and Environment methodology, and presented at the 2019 SME Annual Conference & CMA 121st National Western Mining Conference. A peer review of the report SGC Mining and Reclamation – Evaluating Animas River Water Quality at A-72, conducted by an independent firm specializing in earth and water resources. 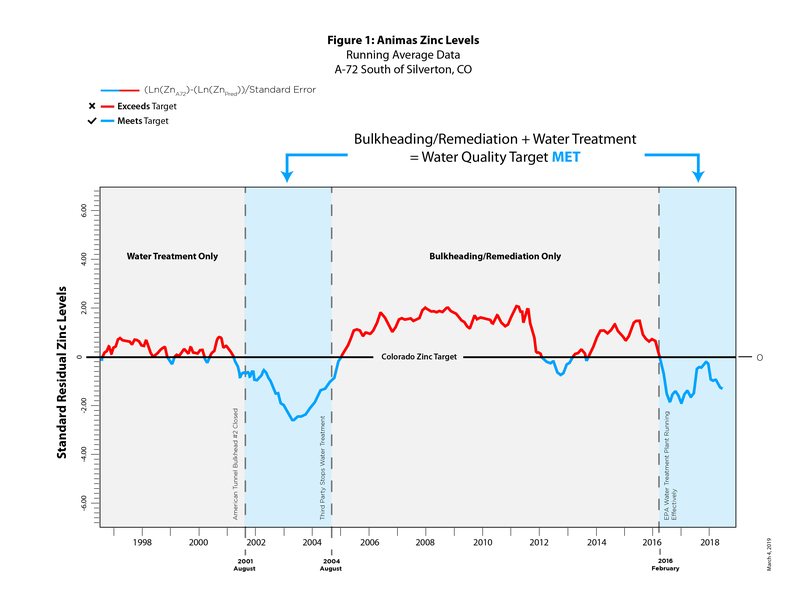 January 2019 update letter to Colorado Department of Public Health and Environment (CDPHE) regarding most recent analysis of 22 years of water data from sampling point A-72. Letter to Colorado Department of Public Health and Environment (CDPHE) regarding analysis of 22 years of water data from sampling point A-72. An analysis of additional Animas River water sampling, including data from September 2018 and data obtained from River Watch. The new data reconfirms the fact that SGC’s bulkheading and remediation was successful and improved water quality by substantially reducing acid rock drainage and metals loading in the Animas River. Three years after the Gold King Mine spill, Sacrison Engineering has analyzed the work conducted and identified many avoidable errors centering on EPA’s Gladstone Interim Water Treatment Plant. A link to public comments about EPA’s Proposed Plan for Interim Remedial Actions at the Bonita Peak Mining District. A comprehensive analysis of 20 years of water samples, including recent sampling from 2018, conclusively demonstrates that SGC’s bulkheading and remediation was successful and improved water quality by substantially reducing acid rock drainage and metals loading in the Animas River. What is EPA Doing to Clean Up the Gold King/Animas River Disaster? An expert analysis of EPA’s response to the Gold King Mine blowout. A summary of the report "SGC Mining and Reclamation Activities and Metals Loading in the Animas River." Researched and written by an expert in geochemistry, this report provides significant detail into the geology and natural conditions of the Silverton Caldera, the area’s mining history, and SGC’s mining and reclamation activities. It concludes that SGC’s mining and reclamation activities each substantially reduced metals loading in the Animas River from what would have otherwise been the case. As part of its reclamation and remediation plan, SGC installed concrete bulkheads in the Bonita Peak area, which are stable and performing as designed. This report provides significant detail on the engineered concrete bulkheads SGC installed to isolate the interior workings of the mine and cause the water table to return toward natural levels. The Bonita Peak area, located in the Silverton Caldera, and its complex geology and mineralization, has been studied extensively, with sufficient research and knowledge in place to support intelligent decision-making to improve water quality and reduce metals loading in the Animas River. Based on evidence-based research, the remaining significant source of metals loading in the Animas River is due to point sources in the Cement Creek drainage, and these flows should be targeted for treatment to substantially reduce metals loading in the Animas. The report concludes that further study is not required to make a decision on next steps to improve water quality in the Animas River. With the goal of treating water in Cement Creek to improve water quality in the Animas River, this report compares two options: passive treatment or active treatment. The strong conclusion is that an active treatment plant will provide the greatest certainty of immediate beneficial results and will give flexibility for the future. There are many reasons why passive treatment is not the solution, including geography, weather, and passive treatment’s unproven effectiveness in this specific setting. The report provides a thorough analysis of the Environmental Protection Agency’s actions around the Gold King Mine spill in August 2015 and how in September 2016, the “Bonita Peak Mining District” – a huge and diverse geographical area covering more than 100,000 acres – was added to the Superfund listing. The report also suggests a path forward.